4 Bedroom Detached House For Sale in St. Helens for Offers Over £250,000. Brought to the market with the benefit of no onward chain, we are truly delighted to offer for sale this impressive four bedroom detached family home. 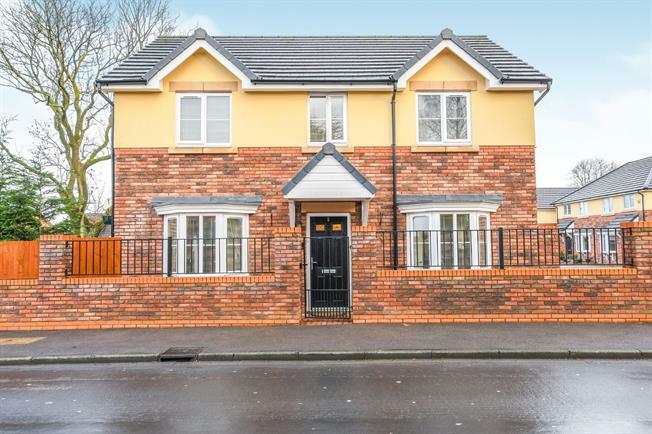 It is conveniently placed for local shops, schools and amenities, in addition to boasting excellent transport links via major motorways including the M62, making this ideal for the commuter kind. . Standing well within its uniquely generous sized plot, the accommodation in brief comprises; Entrance hall, spacious lounge, kitchen/diner, utility room and WC to the ground floor. Whilst to the first floor, there are four bedrooms, with the master having an en-suite facility and family bathroom. Externally, to the front of the property, there is a driveway providing off road parking and access to the detached garage. To the side, there is further parking for two vehicles and a gate to enter the pleasantly unique gardens consisting of patio area and a well presented laid to lawn garden with flower an shrubs borders. Uniquely an additional private garden can then found to the side of the garage, which is accessed via the main garden. Keeping in with the modern build, the property has an array of mod cons throughout. Internal inspection is recommended to fully appreciate, what this property has to offer.. Door to front, stairs to first floor, radiator, heating control. Bay window to front, window to rear and side, French doors to side, to access patio area, feature electric fire, two radiators, television point. Bay window to front, window to rear, fitted with a range of wall and base units with work surface over, breakfast bar area, inset sink unit, built in fridge freezer, built in oven, hob, integrated dishwasher, Karndean flooring. Door to rear, window to rear, wall and base units, boiler. Low level WC, pedestal wash hand basin, tiled flooring. Window to side, built in wardrobes, radiator, access to en-suite shower room. Window to rear, walk in shower cubicle, pedestal wash hand basin, low level WC, part tiled walls. Window to front, loft access, radiator. Window to side and rear, radiator, usb sockets. Window to rear, spotlights to ceiling, fitted with a three piece suite comprising; panelled bath with shower over, pedestal wash hand basin, low level WC, radiator, part tiled walls and flooring. Externally, to the front of the property, there is a driveway providing off road parking and access to the detached garage. To the side, there is further parking for two vehicles and a gate to enter the pleasantly unique gardens consisting of patio area and a well presented laid to lawn garden with flower an shrubs borders. Uniquely an additional private garden can then found to the side of the garage, which is accessed via the main garden. Outdoor sockets, lighting and automatic hanging basket sprinklers are some of the mod cons boasted.